Wholesale Trader of a wide range of products which include ustiletto foot massager and ufootsie - soothing warm-spa foot massager. Having stunning, healthy and beautiful legs can be easy and hassle-free. Slip into the uStiletto daily, anytime round the clock for attractive legs. • Apply moisturizing lotion and exfoliate your legs regularly; complete with a good leg massage for healthier and smoother skin. • ‘Reflexology’ massage programStimulate vital reflex points to enhance circulation and the curative effects of the massage. • ‘Pamper’ massage program Gently awaken your legs to welcome the start of a brand new day. • ‘Relief’ massage programReduce the stress and tension accumulated on your legs and ankles. • ‘Beauty’ massage programTone and shape your legs to restore its vitality and glamour. • ‘Sleep’ massage programRelax your body and mind for a restful beauty sleep. uStiletto’s auto massage programs strive to allow every woman to put on her favorite stilettos in comfort, and to take each stride with confidence and pride. 1. Pamper – A combination of gentle and comfortable massage techniques to soothe any discomfort that arises from wearing stilettos. It is the perfect choice for users new to leg massage. 2. Relief – Emulating the agile kneading and pressing massage techniques of a professional masseuse, this program relieves the tension accumulated on tired legs and ankles after a day of walking on stilettos. 3. Beauty – Intense airbag massage improves circulation and metabolism in the legs, achieving healthier and beautiful legs that you have always desired. 4. Reflexology – Its strong reflexology massage helps to improve metabolism for better well-being, giving you a healthy glow that shines from the inside out. 5. Sleep – The ideal pre-bedtime massage to ease tension accumulated over the day and prepare the body and mind for a restful good night’s sleep. The airbags are strategically positioned so that they can massage your ankles, soles and calves separately. Intense airbag massage effectively melts away the tension caused by wearing stilettos, relieving muscle aches and strains for lighter footsteps. Adjustable intensity – Choose the airbags intensity (Lo, Mid, Hi) according to your preference. Customizable rollers speed – Adjust the speed of the rolling massage (Lo, Hi, Pulse) that suits you best. Soothing warmth – Effectively soothes muscle ache and boosts the curative effects of a pampering leg massage. Hygienic and convenient – Removable and washable inner fabric lining for better hygiene. Stretchable and fitting – Expandable socks that fit snuggly on your legs for maximum comfort. 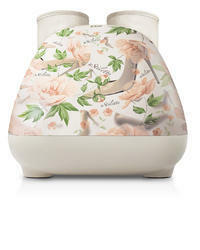 Light and portable – Easy to move around, so that you can have a pampering leg massage anytime, anywhere. The Power of warmth - The soothing warmth in uFootsie helps loosen stiff muscles, so that you benefit from the full curative effects of the massage. Feel the tension in your legs melt away as it also aids circulation which increases the flow of blood, oxygen and nutrients for quicker recovery to keep your legs strong and healthy. An indulging treat during the cold seasons, the uFootsie is perfect for keeping cold, clammy feet warm and relax! 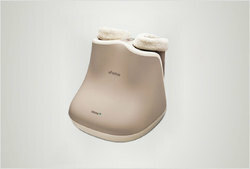 Warm-spa auto massage programs - With unique synchronization of vibration massage and warmth, the uFootsie has 5 auto massage programs to meet varying needs. From a gentle, soothing massage to a more intense and stimulating session, it relaxes and rejuvenates your calves, ankles and feet. Enhance massage experience - Stylishly designed with fabric socks to trap the warm air within, the uFootsie allows easy access, better massage coverage and better fit for extra comfort. Looking for Foot Massager ?